Your QT9 installation is Employee Portal enabled. QT9™QMS Web has been developed and optimized to run on non-beta versions of Microsoft Internet Explorer (version 8.0 or greater) and/or Firefox (23.0 or greater) browser engines. 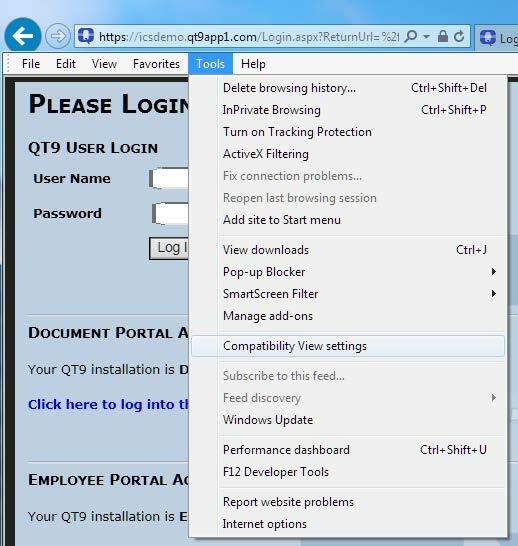 Your current browser should still be able to access and use QT9™QMS Web; however, you may experience issues or miss out on some of the features. We recommend you upgrade or switch your browser to one of the preferred browsers mentioned above to fully utilize and enjoy QT9™QMS Web. 1. 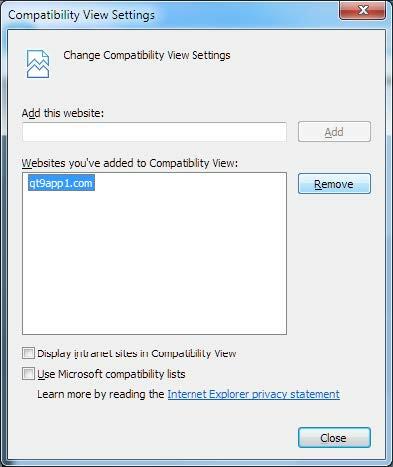 Open the “Compatibility View Setting” from the Tools menu in Internet Explorer. (If you do not see the menu bar, press “Alt” on your keyboard and it will appear). 2. Locate and remove your website URL (YourCompany.qt9app1.com). Alternatively, the entry in the list may just be qt9app1.com. 3. Click close and your site will reload running in regular / non-compatibility view mode. You account does not currently have a full name associated with it. Please provide your full name in the field below. NOTE:Your full name should be unique as it will be used for display purposes for all QT9 fields (e.g. responsible party, approvals, timeline entries, etc). If you need to recover both of your User Name and Password, please contact your Site Administrator for assistance. Your current password has expired and needs to be reset. Please enter your new password here. QT9™ ISO Management Software - Copyright © QT9 Software Inc. Your current session has been idle for 0 minute(s). This screen will lock when the idle timer reaches minutes.